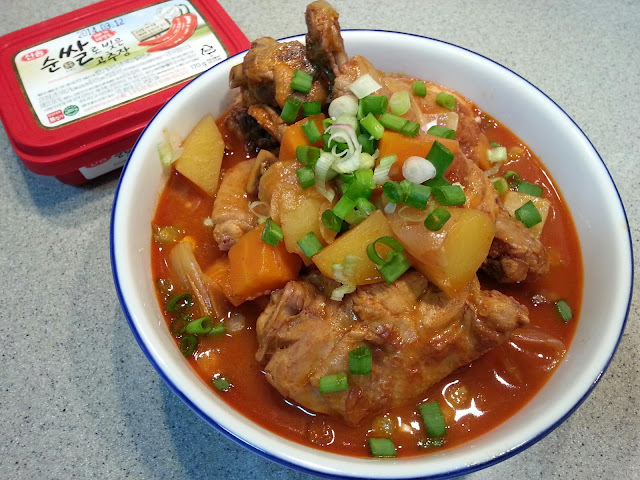 A few weeks ago I bought a tub of gochujang (Korean chilli paste) to make one of our favorite dish, kimchi soup. But I didn't know what to do with the remaining chilli paste, so I Googled gochujang recipe and discovered this dish. Sounds simple enough, and I have most of the ingredients, so that was dinner tonight. I substituted or opted out some ingredients that I didn't have, but the end result was still quite delicious. Hubby preferred it to be more spicy, so next time would add more chilli! Me, I thought it tasted delicious, hearty and perfect with a steaming bowl of rice. Your choice of vegetables, I chose potatoes, carrots, wong bok cabbage and some leftover brown button mushrooms. 1. Marinate chicken pieces in wine and seasoning. Brown meat with a little oil. 2. Set chicken aside and using the same pot, stir fry all the vegetables and garlic. 3. Put chicken back in and add water or chicken stock till it covers about 2/3 of the meat and vegetables. Add seasoning sauce and stir well. 4. Boil for 15-20mins or until the sauce has reduced near half. 5. Add in sesame oil and garnish with spring onions before serving. I love the sweet after taste of the gochujang chilli paste, but next time would add some fresh chilli to give it more kick! Anyway, definitely a keeper! For the original recipe, see here.